"Congratulations to Michelle Miller-Day for writing a readable academic study…This book will appeal to those studying relationships between adult kin. This is also a useful book for practitioners and family therapists who want to help family members communicate through respectful negotiations." "Miller-Day presents a theoretically rich analysis of maternal relationships in an engaging and easily digested format. This book is appropriate for a wide audience. 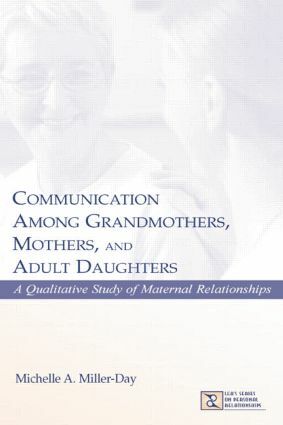 The entire book would be a worthwhile assignment for undergraduate and graduate students….excellent supplementary readings for graduate courses in women's studies, the psychology of women, family systems, adult development, and qualitative research methodology….the book may be useful to clinicians….it provides relevant insight into the dynamics at work in women's formative relationships." Contents: Series Foreword. Preface. Part I: Setting the Scene. Velvet Chains: Understanding Maternal Relationships. The Qualitative Research Journey: "How Did I Get Here and Where Am I Going?" Grandmothers, Mothers, and Adult Daughters in Elkwood. Part II: The Action. Contradictions. Patterns of Interaction: Best Intentions, Bitter Regret, Resentment, and Love. Part III: The Denouement. Theoretical Development. Grandmothers, Mothers, and Adult Daughters: A Force to Be Reckoned With. Epilogue.